Filmmaker Karan Johar is back on Television with the sixth season of his entertaining chat show, Koffee With Karan. The new season began with Bollywood’s blockbuster leading ladies, Alia Bhatt and Deepika Padukone. 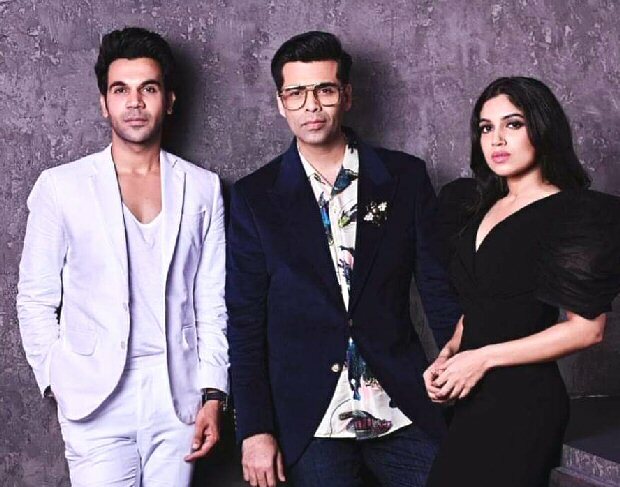 As this year’s theme is to bring interesting duos to the coffee couch, the latest stars to film an episode of Koffee With Karan are Rajkummar Rao and Bhumi Pednekar. Bhumi Pednekar was definitely one of the breakout stars of 2017 with two successes at the box office – Toilet – Ek Prem Katha and Shubh Mangal Saavdhan. Rajkummar Rao is a living and breathing example of the whirlwind fame that suddenly erupted in 2017 with Trapped, Bareilly Ki Barfi and Newton. With the success of Stree, he has emerged as a Rs 100 crore hero. This season of Karan Johar’s show will feature interesting duos including Arjun Kapoor – Janhvi Kapoor, Saif Ali Khan – Sara Ali Khan, Akshay Kumar – Ranveer Singh, Diljit Dosanjh – Badshah, Abhishek Bachchan – Shweta Bachchan Nanda while Aamir Khan will make a solo appearance.